We are no strangers to the third generation of Bailey’s flagship line-up of Unicorn caravans, having already reviewed the Valencia, Cadiz and Seville. So, our curiosity was piqued when the Bristol firm reported that the three-berth Madrid caravan is one of its top sellers. Three-berth? Yes, for 2015 Bailey is so confident that this caravan is meant for couples that the fold-out bunk that compromised dinette space before is now only available as an option. For the 2015 Unicorn, Bailey has rationalised production by making all models, except the compact two-berth Seville, with the same body dimensions. That means for 2015 the Madrid is considerably longer than it was in 2014 and is now one of the most spacious couples’ caravans you’ll find. You could just about play a game of tennis in the third generation of the Madrid. It’s well specified, too, with Alde 3020 programmable wet central heating, a 100W solar panel and an external gas point. It also has a full complement of Al-Ko goodies, including shock absorbers, a wheel lock and an ATC anti-snaking device. that serious caravanners will appreciate. In particular, both the toilet cassette hatch and the easy-access hook-up point are on the offside so they won’t intrude in the awning or create a trip hazard. Under the skin, there is further evidence of thoughtful design. The gas cylinders, for example, are in the centre to cut noseweight. The battery is housed under the floor near the axle line to improve weight distribution, and the consumer unit is alongside it, beneath the fridge. There are proper branded tyres, too, fitted with tyre pressure sensors, although the monitor is a cost option. One of the Unicorn’s big selling points is the full-height, opening front window. It’s part of an impressive package of glazing that allows the van to be flooded with light during the day. The artificial illumination is just as good. LED spotlights give a lovely warm ambience – and you’re spared the risk of bashing your head on ceiling lights. The new Kensington cloth trim is a little dated, though we like the purple cushions and curtains. If you’re not keen, you can upgrade to leatherette Trafalgar upholstery (£199). The sense of space here is fantastic, and the huge sofas can seemingly accommodate a whole party of ralliers. Our only real quibble is over the placement of the table. If the small pull-out coffee table isn’t big enough, you’ll have to dig into the back of the wardrobe to retrieve the freestanding item. Bailey could have found place for it in the large dresser. With the gas locker placed on the offside of the van near the centre line, you might expect it to eat into kitchen storage space. But Bailey has cleverly made the galley L-shaped giving additional storage and worktop space. It works really well, creating a visual separation between the lounge and kitchen. A lift-up extension flap lets you add to your worktop when needed. Spec-wise, you get all you could need, with the separate oven and grill, dual-fuel hob and standard microwave, although its location directly over the hob could be a problem if you’re juggling pans. There’s even room for a drinks cabinet – albeit only for three bottles – and the Madrid is unusual among Unicorns in having its space-saving Dometic tower fridge/freezer on the offside. Opposite, there’s a two-seater dinette with generous, curved corner cushions. It’s plenty big enough for couples to use for all their meals. Forward of it is a vast dresser top for the TV with a shelved cupboard below. Only the spindly table leg detracts from this inviting space. We’d have preferred an opaque window on the rear wall. Otherwise, we have few complaints about this full-width washroom. Behind the stylish Perspex door, there’s a huge shower – 25% larger than in the old Unicorn. Thoughtful additions are the neat, built-in shaving mirror and laundry basket. There’s plenty of space around the Thetford electric-flush toilet, though the room does narrow towards the shower so the sink is relatively small. At night, there are plenty of options. The sofas are long enough to make generous twin berths (at 6ft 2in on the nearside and 6ft 4in on the offside), albeit fairly narrow at 2ft 2in wide. Pull out the tracked slats from beneath the central chest to assemble a double that is simply vast, at 6ft 6in by 6ft 2in. Reading lights at all four corners allow you to arrange yourselves however you wish. If you invite someone to stay over, your guest – even a tall one – will be comfortable on the wide, 6ft 4in single, made up by lowering the dinette table to form a base. Reading lights are fitted at both ends. You’ll struggle to fill all of the available storage options in this tourer, with 11 overhead lockers, the bed boxes, a front chest, the large sideboard and an enormous wardrobe. We also liked the useful airing cupboard in the washroom, where an Alde radiator should keep your towels nice and warm. Perhaps the biggest complaint is the lack of external access to storage space, with only one outside locker door into the under-bunk space on the nearside. It is, however, lined with plastic to make it a good place to store muddy gear. We’re not surprised that this caravan layout is so popular, because it makes few compromises. 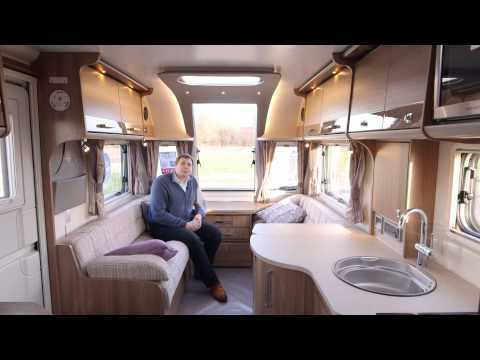 Although it's only a three-berth caravan, the 2015 Bailey Unicorn Madrid is spacious throughout, with a fine washroom and kitchen, and plenty of storage. It’s also flexible: you can use the lounge as a fixed double and keep the dinette for meals, or entertain in the front. At a shade under £21,000, it’s not cheap for a three-berth van, but the kit list still makes it great value. You can find Bailey caravan dealers from Rosshire in Scotland to Redruth in Cornwall, from Great Yarmouth in Suffolk to Conwy in North Wales, County Antrim in Northern Ireland – and many more locations all over Britain and Northern Ireland.